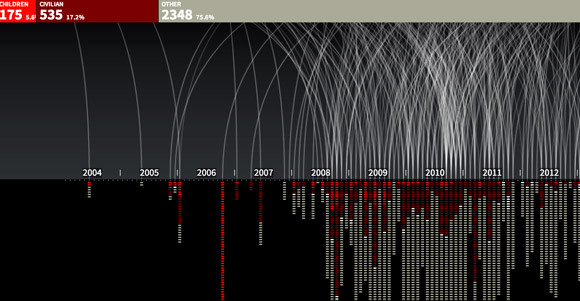 As Noam Chomsky has described earlier this year President Obama’s drone war on terror in Afghanistan, Pakistan, the Yemen and several other countries as just a “global assassination campaign”, designers at Pitch Interactive have now described every known attack by the US since 2004 in a stunning, well shocking, interactive graph and movie using data from the the Bureau of Investigative Journalism. Accordingly, a mere 1.5% of high profile targets were killed while 175 casualties were children and 535 civilians. You may see the video here. 27 March 2013 @ 6:45 pm. Last modified March 27, 2013. This entry was posted in Pakistan, USA and tagged drone war, high profile targets. Bookmark the permalink. You neglected the 2348 ‘alleged combatants’ the study mentions. It’s also interesting to note that as time goes on, the civilian/children casualties drop in numbers. As well, almost half of the children casualties are the result of one single incident close to the start (2006) of the drone campaign. I’m with you in condemning the US’s use of drones in this (or practically any!) fashion, but as far as the stats from this chart seem to go, it appears to indicate drone use is becoming more effective as time goes on. Which isn’t a good thing in my books. “It’s also interesting to note that as time goes on, the civilian/children casualties drop in numbers.” Not really. I’m not sure what “alleged combatants” (the vast majority of those killed) are when it comes to targeted killings, or assassination. I am also afraid, this is only the beginning.